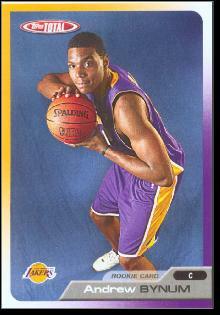 Andrew Bynum was born in Plainsboro, New Jersey on October 27, 1987. His parents, Ernest Bynum and Janet McCoy, divorced when he was one. Andrew and his older brother, Corey, would spend their summers with their dad in North Carolina, and the school year with their mom in New Jersey. Andrew attended three different high schools. For most of his freshman year he went to Windsor Plainsboro High School North. The remainder of his freshman year, and then all of his sophomore year, Andrew attended the Solebury School in Pennsylvania. He played the remaining two years of his high school career at St. Joseph High School in Metuchen, where he averaged 20.7 points per game and 14.9 rebounds. Andrew was named an All-American as a senior in 2005. Instead of going to college, Andrew decided to declare himself eligible for the 2005 NBA draft. He was selected 10th overall by the Los Angeles Lakers. He was the youngest player to ever be drafted, at 17 years and 244 days old. In the 2005–06 season, Andrew became the youngest player to appear in a NBA game. However, he didn't see much time as a rookie, averaging seven minutes a game. In the 2006–07 season, he saw a big increase in his playing time. Andrew started 53 times and played in all 82 regular season games. The New Jersey Nets actually offered to trade Jason Kidd for Andrew, but the Lakers declined. In 2007–08, the Lakers had the best record in their division and Andrew was playing well when, in January, he landed on Lamar Odom’s foot as he came down with a rebound. He dislocated his left knee cap missed the rest of the season. After under going arthroscopic surgery, Andrew was back to full health for the 2008–09 campaign. He set a career high for points with 42 in a January game against the Clippers. He was also a force in the paint, averaging eight rebounds a game. He helped the Lakers win the 2009 NBA Championship. The Lakers would repeat as NBA Champions In 2009–2010. Andrew played the 2009-10 postseason with a torn meniscus. Delaying surgery led to a longer recovery than he expected. Andrew did not play until December 14. Upon his return, he focused more on rebounding than scoring. He dropped from a career-high 15.0 points per game to 11.3 The Lakers lost in the second round of the playoffs to the Dallas Mavericks that spring. A flagrant foul in the Dallas series cost Andrew four games at the start of the already-shortened 2011–12 season. He made up for lost time by establishing new personal highs for scoring (18.7) and rebo9unding (11.8). He had his first 20-rebound 20-point game in 2011-12, and in the playoffs broke Kareem Abdul-Jabbar's franchise record of blocks in a post-season game with 10. The Lakers lost in the second round again, however, this time to the Oklahoma City Thunder.